Most people know me as member of Ireland’s international team. www.racquetball.ie is great source of info of what is going on in the Irish Racquetball scene. I have played both junior and senior World Championships for Team Ireland. and each one of them has been a privileged and a honor. Started playing in 2003 and I made my first junior nationals event In 2004- from there Elma Gibney and Liam Hughes developed a junior Development Squad which they asked me to join. They took me to 4 of my 5 Junior world events and they lit the fire that set me on my path. I think it’s a fantastic attribute of a Coach that their presence alone makes you wanna do better. Rhonda Rajsich – without a shadow of a doubt. 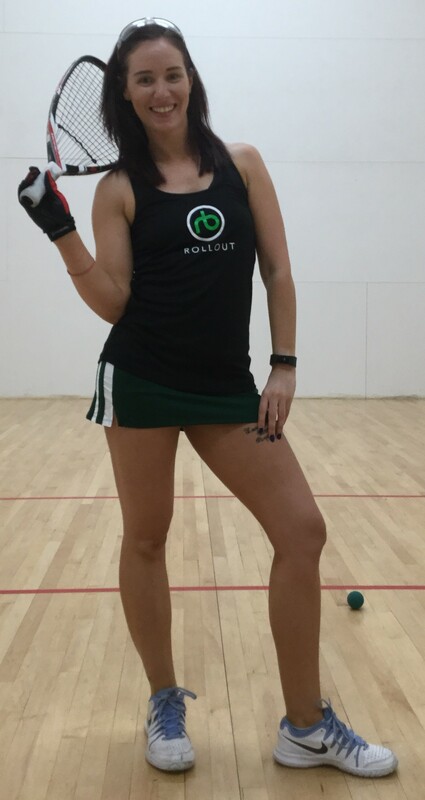 There is nothing in the Racquetball industry that she hasn’t won. She is such a honest and genuine person. Many people know her journey to her World Championship in 2008 – it is such an inspirational story, it just proves the power of self belief and determination. She is approachable and has a kind word for everyone, I’m honored to call her my friend. Samantha Salas – is a class act as well. The difference between impossible and possible, lies in a persons determination, and I’m one determined lady! I have made so many wonderful friends through Racquetball, people that I’m gonna have in life long after their and mine career ends. I’ve gotten to travel the world which has always been a goal of mine. I’m sponsored by ProKennex and Rollout. Shoes: my favourite court shoes Nike Vapour. They are really light, I have to wear cotton socks. Rollout always have me looking stylish on court. Jonathan has done incredible things with his brand and there is more to come. Favorite event: My favorite would be Nationals here in Ireland, but the US Open is a fantastic event, I love attending & playing at it. Best results at tournaments you’ve played in: I had 3 gold medals at Europeans, Irish open, Hamburg open, national finalist. There are so many I have to thank- to Ray Moylette – who has been my trainer (and councilor) for just over 3 years, he helped me set and achieve goals. I’m stronger and fitter than I have ever been and that is lot to do with Ray. To my Coach – Jim Winterton. I would be lost without him, he has helped my develop my game, relit my fire at times when it was burning low. The thing that I love most about Winterton is that he cares more about what going on off the court than on it. To my Mam and Dad – who have always supported and encouraged me to follow my dreams. To my brother Padraic – many know my road to Europeans last year was a bumpy one, I had great support from my coach (Jim Winterton), trainer (Moylette), Physio (Julie Moore), my family and friends but was Padraic that had to spend hours on court with me pushing me even when he seen I was in pain, he never let me give up! Even at Europeans when things weren’t going my way Padraic was the one that pull me aside and told me keep fighting and trust in my training. I wanna thank Joe Devaneny for everything that he contributes to my game. My friends – their support is endless, even though they don’t see me very often. I play Gaelic Football with the Westport Ladies. I love going to the gym (real gym fanatic). What is your hope for the future of racquetball? To see it in the Olympics! It’s all about everyone promoting it in their own area. Kane is a one of a kind athlete and if he was in any other sport his face would be all over the place. Promote Kane what he has done and the records he continues to make, let the world see what an incredible athlete he is, what incredible athletes Racquetball has- players like Gaby Martinez – She is fire cracker, she’s soo exciting to watch! I do a lot of work In the gym, weights and speed training. Drilling and game time with joe Devaneny and my brother. I recently joined a new gym near home – The Movement, one the trainers there Neil Douglas runs Yoga classes – I’ve only done a few sessions with him – but I can see a huge difference. He is fantastic and I highly recommend him to anyone looking to do yoga.